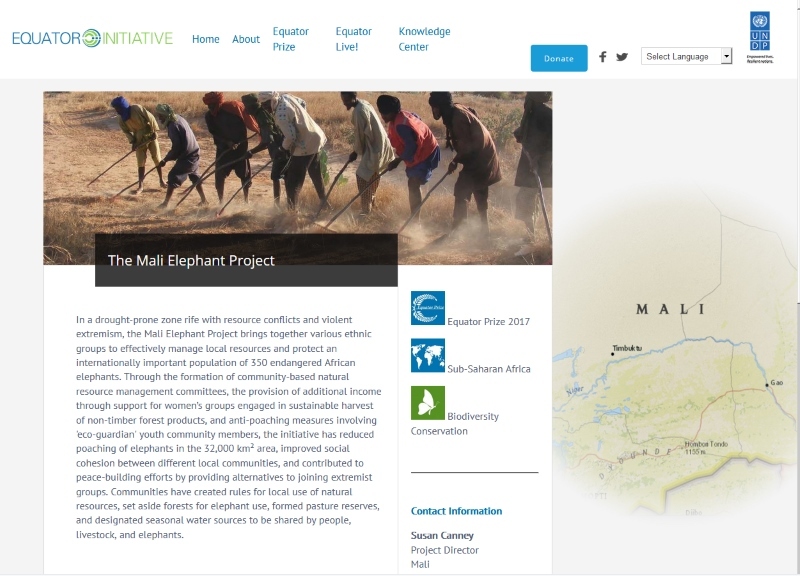 Mali Elephant Project wins the prestigious Equator Prize! June 30, 2017 — The Mali Elephant Project (MEP), a joint project of ICFC and WILD Foundation, is among the winners of the 2017 Equator Prize. The UN Development Programme funded prize is awarded for "innovative solutions for tackling poverty, environment, and climate challenges". Winning organizations will be honoured at a celebratory gala in New York on 17 September 2017. Referring to MEP as "an initiative promoting conflict resolution in Mali to protect the endangered African elephant", the Equator Prize has a page that briefly describes MEP. ICFC would like to recognize Dr. Susan Canney as the key person behind this innovative and successful program, along with WILD's Vance Martin, who has been involved since the earliest days. ICFC became a key funder and co-manager of MEP in 2010.